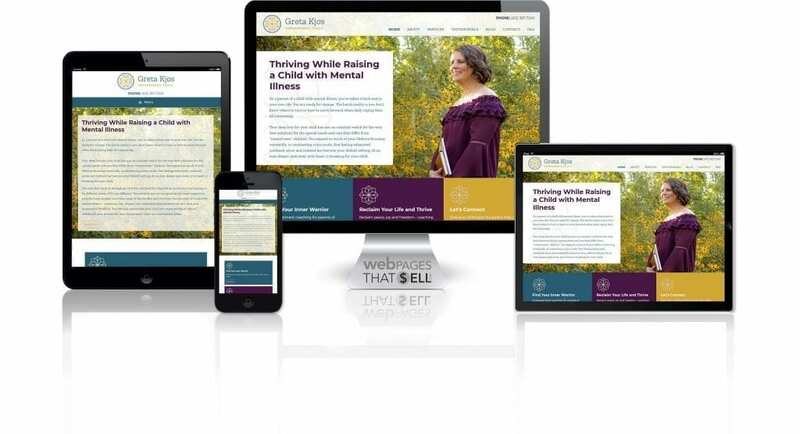 Greta Kjos started a new business and wanted a professional look and feel for her website, social media and print platforms to convey her new brand and services as a coach to parents with children with mental illness. Our work together helped her to position a rock solid brand image, giving her clients confidence that she would be the ideal coach for their tough lifestyle situations. Greta had several life experiences that caused her to reevaluate her lifestyle, self-care, relationships, career, spirituality – truly every aspect of her life. As successful as she was in her corporate career, a situation with her daughter’s mental illness turned her world upside down, causing her to re-evaluate her career choices and start anew. She became a certified coachand eventually migrated her business model to match her passion: offering coaching expertise and support to others that had similar life circumstances – parenting a child with mental illness. Greta knew a website was one way to establish her credibility and provide information about her services for these parents. On her search for the professional expertise she needed, she attended a branding session we held with Inspired Creative. Being impressed with our experience, approach and breadth of services, Greta chose to work with our team, confident she would be able to showcase her services with rock solid brand continuity. We were able to solve two of Greta’s biggest concerns – she wanted to eliminate working with multiple people to create brand congruency and she wanted someone who understood her and was open and patient with her on her journey as a new business owner. We could support her in both areas. We can handle the full spectrum of all things web, graphic design and social media and keep our clients involved in every stage of their project. Starting from scratch with Greta’s new business, it was important to develop a solid brand that would resonate with the parents she was seeking to coach.Our process began with determining what would be attractive to her ideal client – beginning with her logo, color palette, fonts and imagery. Moving into the website strategy, the focus shifted to what relationship she wanted to develop with her site visitors and what action she wanted them to take once they were on her website. Her primary intention was to enroll them into her eNewsletter list. This way Greta could develop a relationship with the parents she wanted to work with, and she felt her newsletter was the fastest way to support them prior to setting up a consultation with her. After the strategy session was complete, we provided two design layouts for Greta that would incorporate her plan. She liked differing components of both layouts, so we combined the layouts into a look that most uniquely represented Greta and her calling with her new business. Moving deeper into the website process, we developed a WordPress theme that would be responsive to our strategy then did a keyword search for the best words and phrases that would help her ideal clients find her. During this time, we had Greta work directly with our copywriter to develop her page by page content. 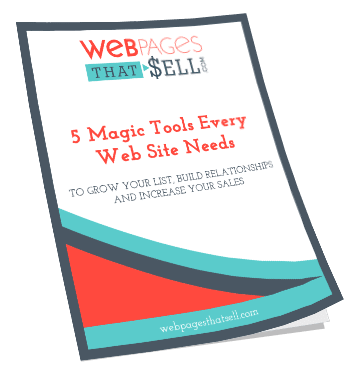 In exchange for collecting email addresses for her eNewsletter, Greta and I worked together to create an awesome free report for her subscribers. We connected the subscriber contact data with her MailChimp account. Greta had fabulous photos taken by Feather Blue Studios, which became part of her website imagery along with some stock photography finishing the website look and feel.Once her professional presence was pulled together, we extended her brand image to her social media accounts. After the website went live, we worked with Greta to become self-sufficient and manage her website and social media platforms with confidence. She produces ongoing content and has both the ownership and tools to post her new messages with ease. Throughout our entire project, we kept ongoing contact with Greta, giving her tools and tips about several areas that she never realized would be important for her brand before she came to us. Keeping her business focus and heart’s passion for coaching parents with children with mental illness – while highlighting her story, her professionalism and authentic personal experience – was the touchstone for our work together. Working with Greta to support her “owning” her message, brand, and the value she brings to her clients because – she IS her ideal client – gave her so much more joy, satisfaction and fulfillment with matching her new “public image” with what’s in her heart. Because I am an expert in my field and my client is an expert in theirs, I feel it is critical to lead my client through a specific process of creating their online and offline brand message. Working with Greta, we were able to pause along the path to completing her project in order to evaluate what served her best at each stage. Ultimately, our deliverables included full brand identity, a WordPress website that is mobile responsive, keyword search and content writing, eNewsletter set up and Opt-In along with auto responder setup, social media channel set up and backgrounds and education on how to utilize tools. Each of these deliverables had several subsets to them. I also included a set of videos Greta could access if she needed immediate support. When her prospective clients visit her website, they will know that she is authentic, can understand them and their needs and feel she is possibly and answer to a prayer. The parents she serves can begin experiencing her expertise immediately and easily with her opt-in gift, webinars, social media and blog posts. Greta’s choice to work with me as her website developer and brand project coordinator gave her the confidence that her online and offline presence would be consistent, have ease of use, be professional and relevant to the parents of children with mental illness she seeks to coach. Having a process in place – including concept, strategy, development and implementation – made our work together strategic and continually moving forward. While our “technical” expertise was being handled in the background, Greta was involved and in touch with our team throughout the process. I would highly recommend Rebecca to anyone looking to level-up their business. I came to her with an idea of where I wanted to take my business and left with a fully executed, branded, integrated suite of materials and social media that encompasses my entire business and is firmly anchored by a gorgeous website. Rebecca was able to do this by truly listening to my needs, helping me find clarity when needed, being flexible and partnering with me along the way. She enabled self-sufficiency with training so that I felt confident taking the reins when our work was done. She kept on top of all the details and honored my timing. There was never a time where she didn’t have things under control."